A great central location means Mixok Inn is busier than most and it’s not a bad place to set your pack down for a few nights. Average rating 6.7 from 337 reviews. The rooms at the modern-looking guesthouse are all air-con, come with a small cable TV, tile floor, hard spring mattress, some furniture and clean but teeny-tiny hot water bathrooms that could be the dictionary definition of “water closet”. This is a solid budget hotel with a more modern feel and English-speaking reception, which you don’t often get in this price range. We like the upper floors since they feel removed from the city busyness and some rooms, like #384, have two sets of windows. The owners are a friendly mob and there’s free WiFi in each room. It’s located right on a bustling corner, across from Wat Mixay, and the lobby has an attached cafe that’s a decent spot for emails and fruit shakes. With breakfast included in the tariff, this place is recommended. Last updated on 10th February, 2019. 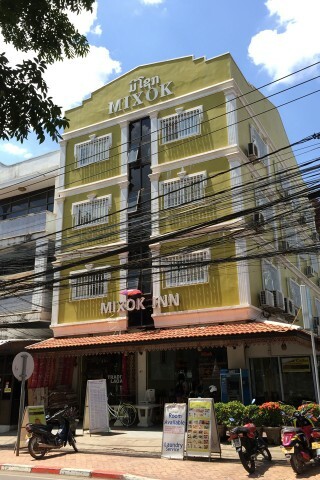 Check rates at Mixok Inn on Booking.com.